Use this game for free. Or join our affiliate program. In this addicting retro action game you take on the role of a tiny hero. His aim is to fight against all villains to free the world: fire missiles, collect power ups and upgrade skills to beat all bosses. new Famobi.com - Relaunch complete! Our baby needed a slight overhaul. After months of putting a lot of thought, hard work and passion (and arguments) into it, Famobi.com is finally re-launched and looking slicker than ever. As you can see we went for a super premium approach, which is a logical step to represent the premium HTML5 games that we offer. Feel free to browse, play and enjoy yourselves. If you have questions, we're always here to help. We've added a new awesome premium game to the Famobi Catalog: 1000 Blocks! 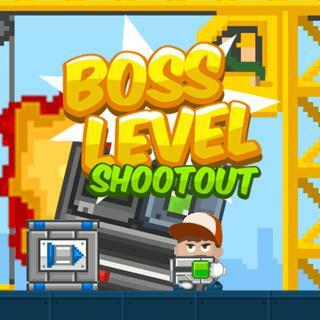 Boss Level Shootout - Find Boss Level Shootout in our vast HTML5 games catalogue. Only the best and newest HTML5 games for all audiences. Guaranteed success with Famobi. Please note: We are currently only looking for games which are full responsive in both landscape and portrait mode and work in mobile as well as desktop browser. They should have a dynamic UI which adapts to the orientation and no ingame texts at all (except for the title). If you have a suitable game, please submit a link for review! Give us a few days to really experience your work of art. In case we think your game is a good fit for us, we'll contact you with the next steps.